Ensure all control switches are off before plugging the machine to power. This includes the speed dial to be at zero speed mark. Do visual inspection around machine making sure there are no loose parts and or objects which could hinder moving parts; if in doubt call your sales representative at Packit the specialist technician. Set the height of the machine head if the machine is in upright mode by adjusting the upright supports. Make sure the head is parallel to the green belt. Once you have your machine plugged into power, you can start putting control switches on; begin with the power ON/OFF switch, then speed dial gently turning it clockwise until reasonable speed of the green conveyor belt is attained. Switch ON the heat and cooler switches at the same time, then set temperature control dial to +-150ºC. You will have to make the machine faster or slower if burning or lack of a proper seal is noticed. Switch off heat first +/-5minutes before cutting power to machine allowing the colling fan to run and cool the heating elements. Failure to do this will result in burning the Teflon belt. Switch power off only with temperatures below 80ºc. Check lock screw on connection of shaft between Green belt rack and main body of machine. Make sure that temperature control adjustment is infinite. Use silicone spray or Q20 to lubricate all bearings on Teflon belt pulleys, toothed rubber belt pulleys and green belt rollers two times a week. Use grease for all gears and shafts at back of machine once every month. Wipe outer body of machine using moist cloth and liquid soap. NB: DO NOT SPRAY THE MACHINE WITH WATER UNDER ANY CIRCUMSTANCES! 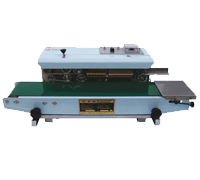 View Our Continuous Bag Sealers here or enquire about this product here or by giving us a call today!